Having to do extensive math to find the center of projects takes time and brain power, but the DCT Centering Ruler, 24" Inch - Center Finding Measurer for Woodworking Rotary, Crafting, Embroidery, Guitar Luthier saves time and is effortless to use. 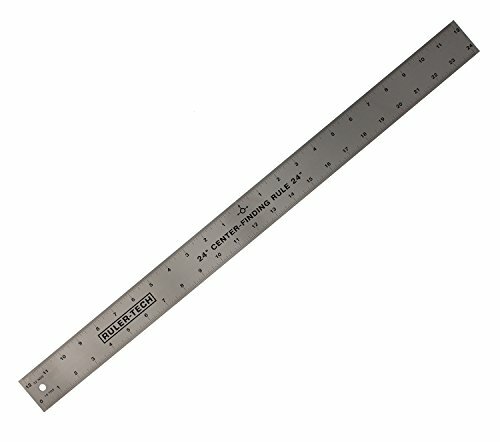 This ruler locates the exact center between any two points on items that are under 24 inches long. It is graduated in 1/32-inch on the top and 1/16-inch on the bottom (32 NDS and 16 THS) and includes blind space at both ends so you can line up the first marking with the edge of your project. It is constructed from stainless steel, and numbers and marked lines are permanently etched into the metal so you do not have to worry about them fading over time. Use the convenient hole on the end of the ruler to hang on your pegboard when not in use. If you have any questions about this product by Deadwood Crafted Tools, contact us by completing and submitting the form below. If you are looking for a specif part number, please include it with your message.